Heat oven to 350°F. Spray bottom of 15x10x1-inch pan with cooking spray. Drain and reserve juice from pineapple; cover and refrigerate pineapple tidbits. Transfer reserved juice to 2-cup measuring cup; add enough water to make 1 1/4 cups liquid. In large bowl, beat cake mix, pineapple liquid, oil and eggs with electric mixer on medium speed 2 minutes, scraping bowl occasionally. Pour into pan. Bake 20 to 25 minutes or until toothpick inserted in center comes out clean. Cool 5 minutes. With handle of wooden spoon (1/4- to 1/2-inch in diameter), poke holes almost to bottom of cake every 1/2 inch, wiping spoon handle occasionally to reduce sticking. In medium bowl, beat pudding mix and milk with whisk 45 to 60 seconds or until slightly thickened but still pourable; stir in rum. Carefully pour over cake, spreading evenly over surface. Work back and forth to fill holes, tapping pan lightly on counter several times. Refrigerate 2 hours. In chilled medium bowl, beat whipping cream and sugar with electric mixer on high speed 3 to 5 minutes or until stiff peaks form. 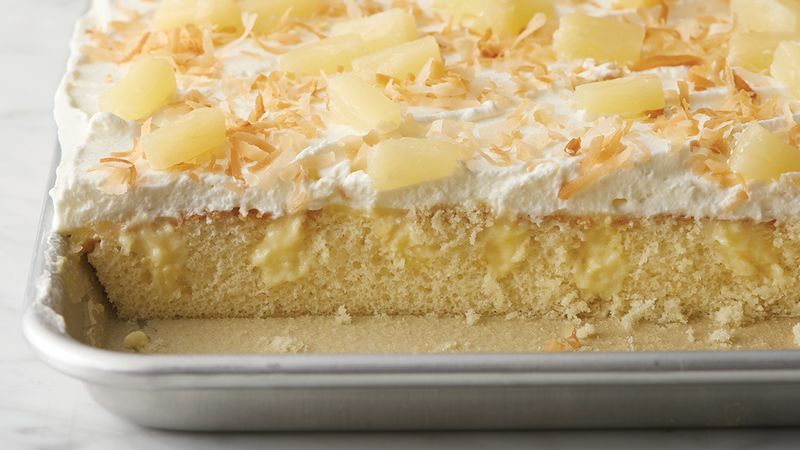 Spread on top of cake; top with coconut and refrigerated pineapple tidbits. To serve, cut into 6 rows by 4 rows. Cover and refrigerate any remaining cake. An easy way to toast coconut is to place in small nonstick skillet and heat over medium heat, stirring frequently, until coconut turns light golden brown. Transfer to pie plate or regular plate to cool.